According to the United Nations, more than four billion people, about half the population of the Earth, experience severe water shortages for at least one month in a year. This is due to climate change, population growth, increasing industrialization and pollution of freshwater resources. The problem at its deepest sense is related to unfair distribution of the water we have. In this month’s “Voices from the South,” we feature translated excerpts from a speech by the 2018 Goldman Environmental Prize Winner, Ms. Francia Márquez of Colombia. Francia was awarded the Goldman Prize for her efforts in spearheading a 10-day, 350-mile march of 80 women to the nation’s capital in 2014, resulting in the removal of all illegal miners and equipment from her community in La Toma, Colombia. The march brought widespread national attention to the environmental and social destruction that illegal mining was causing in La Toma and other communities in the Cauca region. In her speech during the plenary session on “The Struggle for Water” held at the 2018 Norwegian Social Forum / Globalization Conference in Oslo, Francia reflects on the question of structural racism in Colombia and what should come first: drinking water for the most marginalized, or water for use in industrial projects and mining. The plenary session was co-organized by among others the Karibu Foundation. In a recent report from Colombia’s national health institute, only 15.1 % of people living in the Colombian countryside (barely 900,000 people) have access to good quality water. Water is guaranteed mostly to the urban people living in the city. The population that does not have water is mostly in the Colombian-Pacific and in the Atlantic regions, which are territories populated by Afro-Colombians and indigenous peoples. This is a sign of structural racism, which means that these communities do not see their rights guaranteed. The first example is in the northeast region of the country, La Guajira, where we see the impact of the mining industry on water. This region has had a protracted humanitarian and hunger crisis, where there is a high rate of death of children, diseases and malnutrition, as there is no way to grow food. It is a place where there are children dying from lack of water. Women must walk for hours to get water. It is in this region that we find the largest open coal mine in the continent – El Cerrejón. The director of relations of the mine, Carlos Franco, affirms that the mine uses more than 25 million liters of water per day. Residents of the northern part of La Guajira are only allotted 17% of this amount of water for daily consumption by the government. Not only do people not have access to water, the water they do have access to use is often contaminated. This is through the mining process, as well as through the fumigation of coca plants and through the growing a single crop on the same piece of land season after season (monoculture). A second example of unfair distribution and structural racism takes places in my own region, in the center-west region of the country. Here we have the example of La Salvajina, a dam built in the municipality of Suarez. The dam was built at the beginning of the 1980’s, in order to regulate the floods of the Cauca River and produce of energy. 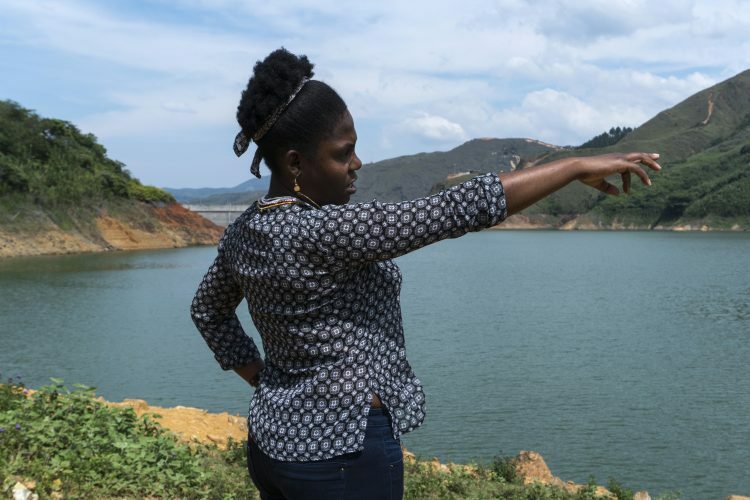 The construction of this dam has had very different effects for the Afro, indigenous and peasant communities of the region as compared to the white communities. The dam has an approximate capacity of 764 billion litres of water, in an area of 31 kilometres. Despite this huge amount of nearby water, vulnerable communities that are in the vicinity of the dam do not have access to potable (drinking) water. The communities get up every day and see this huge mirror of water, yet they do not have water in their homes or for their crops. In contrast, in the nearby township of Popayán – the predominantly white capital of the region – there is over 94% aqueduct coverage for the residents. Here, there is no water scarcity. The worst thing is that there are not even reliable statistics on what happens in the field. There are no reliable studies that identify the magnitude of the problem, about what happens in Afro and indigenous communities. This, in addition to being a sample of the structural racism that still exists in Colombia, also shows how the monopoly of knowledge is used to hide injustices and prevent communities from becoming empowered to transform their realities. A third example takes place in my home of La Toma, located on the left bank of the La Salvajina dam, where one can see the contamination of our water by mining. Here we also see unjust use of the water and land, and here we are leading efforts to change this. In La Toma, we do not have clean drinking water. A preliminary study, carried out by Universidad del Valle in 2015 on the levels of mercury concentration in the water of La Toma, states that the concentration ranges between 50 and 1000 parts per million liter (ppm). The safe level of mercury in drinking water is 0.002 ppm. That mercury in the water is the product of illegal mining that has been introduced into the territory. This is just the beginning, because there is also the threat of unconstitutional mining. By unconstitutional mining, I mean that these were titles given to companies after the communities were displaced by paramilitary groups. They are titles that were also delivered without prior consultation to the communities, violating all the collective rights of the communities. In the region, 239 mining titles have been delivered, covering a total of 40% of the territory. Between 2002 and 2008, 13 mining titles were delivered to domestic and foreign companies in La Toma. This happened after having had a strong presence of paramilitary groups in the region, which threatened and deprived the people of their lands. La Toma has been inhabited ancestrally since 1636 and owned by the community. The companies, after receiving the titles, wanted to evict the community from the territories (with the support of the State). The community of La Toma therefore organized protests and legal actions in order to stay in the territory. In this resistance we have combined legal actions, protests, mobilizations, political advocacy at national and international level and coordination with other ethnic groups and social organizations. We have also conducted mobilizations as women, which have managed to stop the expulsion of our communities. To close, let me go back to the original question of this part of the plenary session on the struggle for water, “water for whom?”. For me it is very clear that access to water is planned from a vision of white supremacy. Priority is given to economic interests over the rights of communities. In the case of Colombia, it is clear that it is the indigenous communities and Afro communities that do not have access to water. The little water they do have access to is contaminated. There are also communities that do not have access to health systems. In Colombia, it will be impossible to make peace until this in reality is transformed. Water today is not for people, it is for big economic interests. In this situation, the European countries and the global North also have responsibility. It is their countries and their transnational corporations that receive the mining contracts. It is necessary to stop this and the policy of death, and it is necessary to come together to save life. The plenary session on “The Struggle for Water” was co-organized by the Karibu Foundation, together with the Norwegian Social Forum, the Norwegian Solidarity Committee for Latin America, Fellesutvalget for Palestina, Attac Norway, Fellesrådet for Africa, and Fivas. 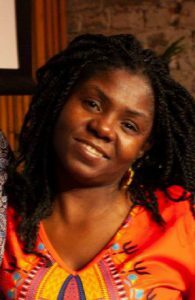 Francia Márquez is an Afro-Colombian human-rights and environmental activist in Colombia. She was awarded in the Goldman Environmental Prize in 2018 for her work to stop illegal gold mining on her community of La Toma and the organizing a protest march of 80 women who trekked 350 miles to Bogotá, to demand the removal of all illegal miners and equipment from their community.